My name is Scott Weed and thank you for visiting my website. Are you interested in an endodontist who will be a strong asset to your patient-care team? Let me share with you some of my thoughts on referral relationships. 1) I'm here to make your life easier any way I can. If you already do most of your own endodontic therapy, that's great. I'd love to be a resource for you to help you keep abreast of the best practices and methods. 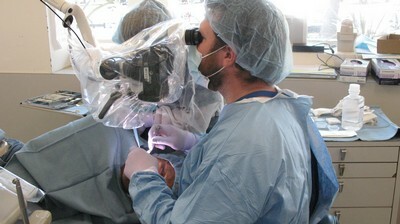 Come join me for one of my REC courses: The Reno Endodontic Continuum. Or stop by the office any time. 2) I'm here at your convenience. I will see your emergency patients today. That's part of making your life easier but it's also what the patients need. You shouldn't have to put a kink in your schedule opening a hot tooth that won't completely anesthetize. 3) I will care about your patients as much as you do. Don't hesitate to call me personally any time of day. Call my office and my staff will give you my personal cell phone. I'm just a call/text away. 4) I put the patient first. I don't have quotas or production goals in my office. I'm not going to "do a root canal" just because there is a warm body in my chair. Each patient receives deliberate and thorough personal attention from me. We discuss all treatment options. And you will be the first to hear about any decision the patient makes.